During his recent trip to China, Secretary of Defense Gates forecast an increased threat of nuclear missile attack on the U.S. by North Korea. A lot has happened since the 2001 NIE, however, raising the question why Gates would have made such a high-profile statement based on an old assessment. 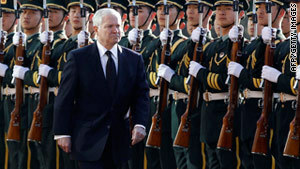 Some reports suggested that his comments were intended as a signal to China. On the other hand, Gates’ statement that “We consider this a situation of real concern and we think there is some urgency to proceeding down the track of negotiations and engagement” may indicate that he was highlighting the threat as a prelude to resuming talks with North Korea with the goal of putting limits on its nuclear and missile programs. Whatever was behind Gates’ statement, it’s worth looking at the current status of North Korea’s missile program, and what would be needed to for it to pose a threat to U.S. territory. I’ve described this in a paper at 38north.org. North Korea has shown it can make technical progress on both its missile and nuclear programs, and you have to assume that process will continue unless steps are taken to stop it. If Pyongyang decides to push ahead in a focused way, it will eventually develop a limited ability to strike U.S. territory with a long-range missile carrying a crude nuclear warhead. Whether that would take five years or longer is hard to say. The pace of North Korea’s progress has consistently been slower than official U.S. estimates. To what extent North Korea’s actual pace is determined by technical or resource limitations is not clear. But the development of its missile program over the past 15 years was slowed very significantly by the flight test moratorium that Pyongyang observed from 1998 to 2006, which North Korea saw as a quid pro quo for ongoing discussions with the United States. Of course, such a threat would not appear out of the blue since it would require Pyongyang to conduct both missile flight tests and additional nuclear tests, both of which can be detected with high confidence. Also, the missile defenses the U.S. is developing are not an effective response. Any country that can develop long-range missiles with nuclear warheads would be able to develop or acquire decoys and other countermeasures that could defeat exo-atmospheric missile defenses, as the 1999 National Intelligence Estimate and other studies have pointed out. It’s important to remember that the development of a North Korean missile threat is not preordained. The example of Pyongyang’s missile flight test moratorium, combined with what appears to be its increased openness to return to the negotiating table, suggests that there may be options for preventing the threat that Secretary Gates has warned about. For the full analysis, go to 38north.org.